A cocktail party is the perfect type of gathering to have at your Springs Apartments home. It doesn't involve as much work as a sit-down dinner and the light, casual atmosphere encourages guests to mingle. You can add to the festive ambiance by designing the party around a theme. Why not try one from our list of favorites? Art and wine is a hot entertainment trend today. Throw your own DIY version by stocking up on paints, glitter and other craft items and let everyone customize their own t-shirt. Don't forget to have plenty of wine on hand! Ask everyone to dress up as their favorite TV, movie or literary character. Stick to one of these choices or leave all three as an option. Every group has at least one Star Wars fanatic who is bound to steal the show! Promote interaction among your guests by having a contest to see who can correctly identify the most characters. Allow everyone to ask each character a limited number of questions for clues. Hosting usually involves preparing an assortment of trendy appetizers, so take the opposite approach. Have everyone bring a dish from a particular time period, such as the 50s or 60s, or have them bring a favorite dish from their childhood. If you want to go the extra mile, ask guests to wear attire from the corresponding era. we ALL scream for ice cream! Pass up the savory snacks and turn your home into an ice cream parlor. Set up a toppings bar with chopped nuts, hot fudge, marshmallow cream, sprinkles and whatever items you can imagine and turn everyone loose. With the variety of toppings available, you won't need any ice cream flavors other than chocolate and vanilla. Another great interactive idea is to have a make-your-own-pizza party. Stock up on pre-made dough, tomato sauce, cheese and plenty of toppings (anchovies optional). Have dipping sauces like BBQ, ranch, bleu cheese and honey mustard on hand for the crusts for an extra touch. Get inspiration from Hollywood's Golden Age and stars like Clark Gable, Katharine Hepburn and Astaire & Rogers. Ask everyone to dress in glamorous outfits and have a "photographer" on hand to greet them as they arrive. Serve martinis, Manhattans and other old-school drinks. Send each guest their picture as a memento of the evening. Tell your guests to wear pajamas and bring pillows and blankets while you pick up an assortment of DVDs. Get a variety or pick a theme like horror movies or romantic comedies. Snack on popcorn, pretzels, M&M's and order out for pizza at midnight. 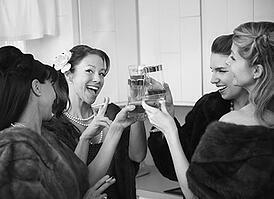 Do you have a creative cocktail party idea to add to this list? Share it with us in the comments!